I'm not sure why, but at my green grocer and EVERYWHERE this week there were lots of cheap strawberries for sale. Wonderful, but a little odd considering it's the middle of winter here! 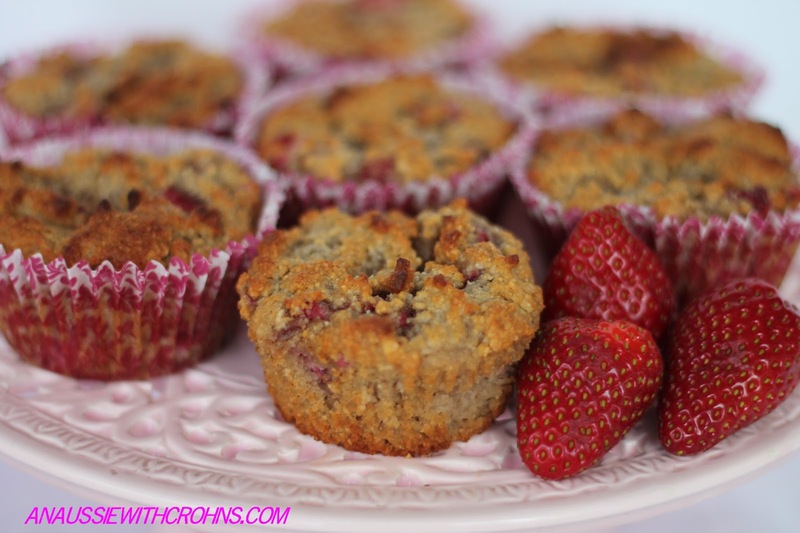 Strawberry & White Chocolate Muffins. Melt cacao butter in microwave (about 2 mins). Use a hand mixer to beat banana, coconut oil, cacao butter and honey. In another bowl, mix together almond flour, coconut flour, vanilla and baking soda, breaking up any lumps. Spoon into muffin cases and bake in oven for 20 - 25 mins. These look great. Just a quick question...I was about to make them when I realised that you mentioned beating the cacao butter, but mine is solid. Am I to melt it first? Thanks for the lovely recipe! Thank you! I'm going to try to make them tomorrow as I have some lovely, fresh strawberries in the fridge. I didn't want to go ahead with it today until I got your answer in case I was missing something :) I'll definitely let you know how they turn out. I think these will be a yummy breakfast idea for our 21 year old son...it's so hard to get him to eat in the morning (lol if he's even out of bed when it's still morning). Just trying these now......forgot to put the banana in so I hope they work out alright! does the banana need to be really ripe? Hi Deb! Recipe looks awesome! Any suggestion for someone who is allergic to almonds, what could I substitute instead of the almond flour? Hi Sierra, any other nut flour would work. If you aren't able to have nuts, just coconut flour would work, but not as a 1:1 substitution. A little coconut flour goes a long way! I'll have to add this to my list of things to try in the future! Is there anything I can use in place of banana I cannot eat them and that goes for this recipe or in general how do I substitute for a banana? Can I use frozen strawberries or is it best to use fresh?